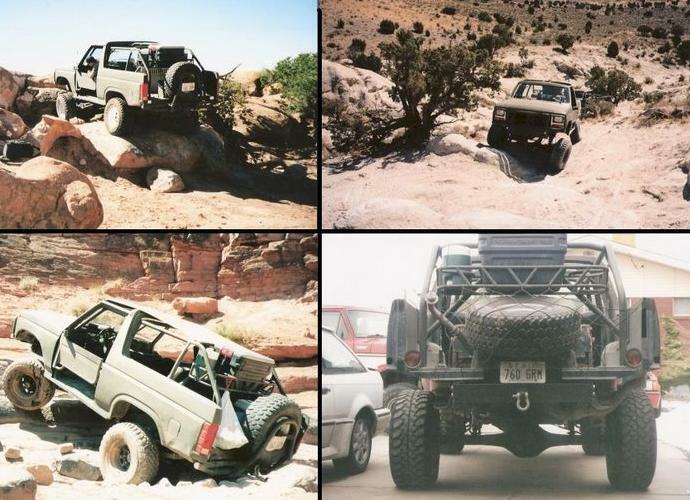 Here's a look back at some of the work I did on our rockcrawler. It started out as a bronco and ended up something totally different. It's a real fun rig to drive and was fairly cheap to build. Remember the weenie front end that was on these? It's time for it to go! I stripped out the old ttb and searched the junkyard to find a ford high pinion SOLID dana 44. I had to fabricate all my own brackets and I modified the old radius arms to work with the new axle. I made a jig to mount the arms in to achieve the correct axle placement front to rear and the correct castor angle. 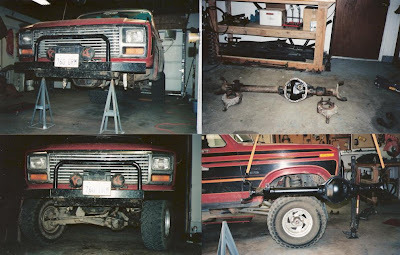 These before and after pictures really show how much of a difference the solid axle made. You can see in the first picture how the camber angle changes as the axles droop towards each other. 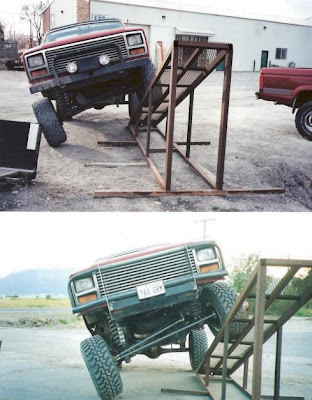 This would create uneven tire wear and would reduce the traction and weight distributed to the drooping tire as it is just hanging in mid air at full articulation. Ah, yes, this is more like it. Notice how much further up the ramp I was able to travel and how the tires stay parallel with each other at all times. The solid axle also creates a leveraging affect so that more weight is transferred to the drooping tire. Believe it or not, the truck actually felt a lot more stable this far up the ramp than with the ttb at it's maximum travel up the ramp. This is also a stronger, more reliable set up since there are less moving parts to wear out and break. Next was the roll cage. This was constructed out of 2" OD, .120 wall DOM tubing. This was all done with a hand/hydraulic style bender with the help of Shelly and her dad. I was quite impressed that we were able to do this in basically one weekend and have it turn out as well as it did. Now that I have a more sophisticated bender, I am even more impressed at what we did. I also made a custom dash with the cage so the cage would fit up closer in the cab. We primed and painted the truck in our garage in Syracuse. These pictures show the gray primer. The final color was OD green. The various bumpers and tire carriers seen in the photos were also built by me and changed a lot with our needs or likes/dislikes. I found along the way that the more weight I took of the rear especially, the better, so it eventually got lighter and lighter and shorter and shorter. At some point along the way, the stock C-6 transmission wore out, and required us to trade it in for a rebuilt one. The rebuilt transmission came with stronger parts and a low stall torque converter. The low stall torque converter was a must have more crawling in the rocks, since it made the power a lot more controllable and eliminated the "launching" effect. Around this same time, I ended up having to take the engine out for some reason, possibly to make the new motor mounts, so I decided to repaint it and dress it up a bit. At this point I was still holding on to the belief that I could make the holley 4 barrel carb work off-road. I had every off-road part made on the carb including spring loaded needle, pressure regulator, extended vent tubes, you name it. It worked better than it did, but eventually I just pulled a motorcraft two-barrel carb out of the junkyard and rebuilt it. 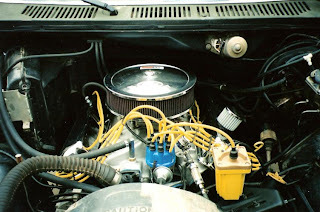 The motorcraft carb just simply is a better design for off-road with the main jet being deep in the bottom of the fuel bowl instead of on the side it didn't starve on downhills and flood on uphills, the motor will run at almost any angle now, sometimes I have to turn the motor off because the oil pump is being starved because the angle is so severe. Here is a picture of the dressed up engine in the truck. This is the best it has, or will ever look. I later had to replace the blue polyurethane bushings I put in for motor mounts with brass bushings that I made on Wayne's lathe. Now the motor stays put! 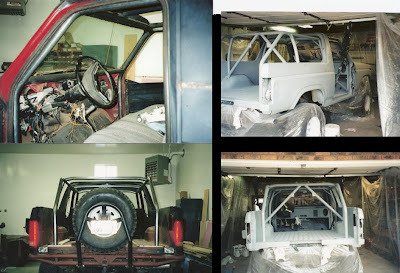 Below are a few pictures of what will wrap up "phase 2" of the bruce build. It still basically had a full body. The bottom right corner is actually kind of a teaser pic for phase 3 which had some of the outer body panels removed, after getting frustrated with replacing so many tail lights, and trying to keep the body looking decent, for a slimmer more agile machine. Somewhere at the ending of phase 2, the rear axle broke on golden spike and we had to tow it out destroying the stock carrier. Although the lockrite was still in one piece and usable, I decided to install a full spool in the 9" rear axle, and some aftermarket currie axles. 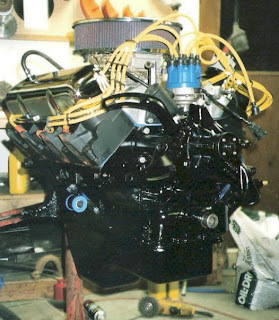 The front and the rear had 4.56 yukon gears, and the front eventually received a cable activated OX locker. 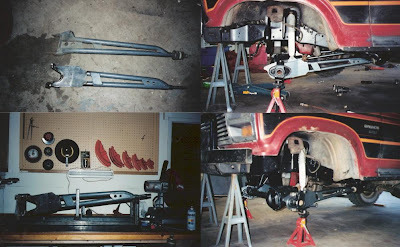 The front axle still had the stockish shafts and u-joints. This problem will be addressed later in the build. Click here to See what it looks like now!